DURHAM, N.C. – Poaching and habitat loss have reduced forest elephant populations in Central Africa by 63 percent since 2001. This widespread killing poses dire consequences not only for the species itself but also for the region's forests, a new Duke University study finds. 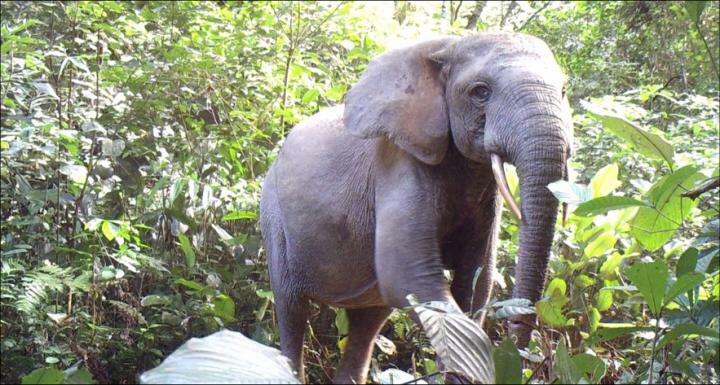 "Without intervention to stop poaching, as much as 96 percent of Central Africa's forests will undergo major changes in tree-species composition and structure as local populations of elephants are extirpated and surviving populations are crowded into ever-smaller forest remnants," said John Poulsen, assistant professor of tropical ecology at Duke's Nicholas School of the Environment. These changes will occur because elephants are ecological engineers that help create and maintain forest habitat by dispersing seeds, recycling and spreading nutrients, and clearing understories, Poulsen explained. "Because they are very large animals, they can eat fruits and disperse seeds too big for other animals to digest. And because they are highly mobile, they help disperse these seeds far and wide through their dung," he said. In the elephants' absence, scores of tree species may be left without a means of long-distance seed dispersal, which is essential for forest structure and colonization. Trees whose seeds are dispersed by smaller animals could fill the void, dramatically altering forest composition. Fewer elephants will also mean a more limited distribution of the nutrients contained in their dung. "Many of Central Africa's forests are nitrogen limited. Elephants help compensate by moving nutrients, especially nitrogen, across the landscape as they defecate. If populations continue to shrink, this nitrogen will be concentrated in smaller and smaller areas, limiting future tree growth elsewhere," Poulsen said. Understory density will also be affected. "Elephants have a large effect on forests by eating or trampling slow-growing plants and opening the understory, allowing more light in and reducing competition for water and nutrients," Poulsen said. "These changes alter the recruitment regimes of tree species — favoring some and not others." He and his colleagues published their peer-reviewed study March 1 in the journal Conservation Biology. To conduct their analysis, they reviewed 158 previous studies on forest elephant behaviors and their cascading ecological impacts. By cross-referencing these impacts with data on local elephant populations, forest tree-species composition and structure, nutrient availability, and understory growth in existing Central African forests — both protected and unprotected ones alike — Poulsen and his team determined that up to 96 percent of all forests in the region were susceptible to dramatic changes if elephant populations shrank or disappeared. "Stopping poaching is an urgently needed first step to mitigating these effects," he said, "but it will not be easy. Long-term conservation will require land-use planning that incorporates elephant habitat into forested landscapes that are being rapidly transformed by industrial agriculture and logging." Coauthors of the new paper are recent Duke Ph.D. graduate Cooper Rosin; current doctoral students Amelia Meier and Chase Nunez; undergraduate Jennifer Callejas; Master of Environmental Management graduates Emily Mills, Emily Blanchard, Sarah Moore and Mark Sowers; and former postdoc Sally E. Koerner, now on the faculty at the University of North Carolina Greensboro. Funding came from the Duke University Center for International and Global Studies and the Africa Initiative at Duke.